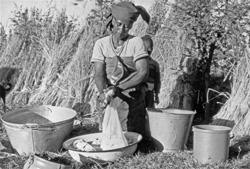 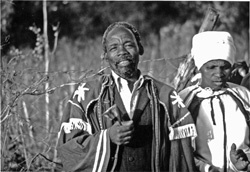 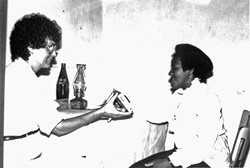 Description: Bishop and Mrs. Mpehla of Misty Mount. 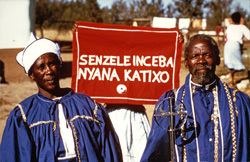 Banner says: "Have mercy on us Son of God." 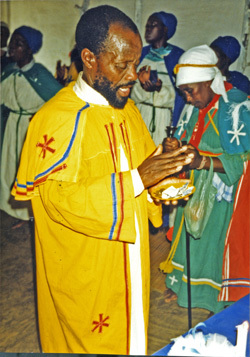 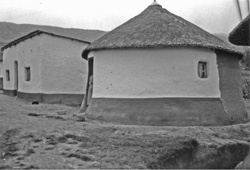 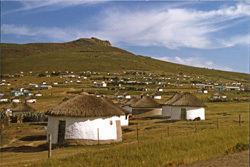 Description: Bishop Mpehla of Misty Mount. 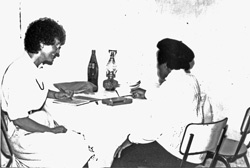 His wife is on left side of photo in red uniform. 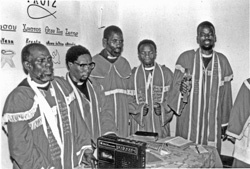 Description: "Members of the Africa Independent Church called the National Congregation of Christ in Zion with Bishop Mpehla as leader. 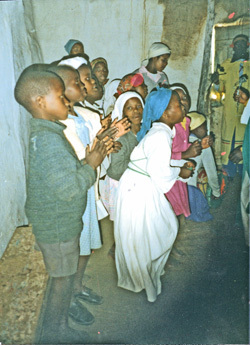 There are 4 congregations of this AIC church." 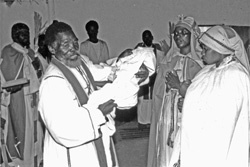 Description: "Child dedication at Zionist service. 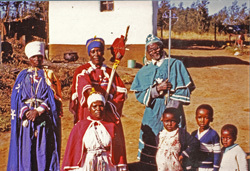 Bishop Nombinja of the Congregational Catholic Apostolic Church in Zion of Transkei." 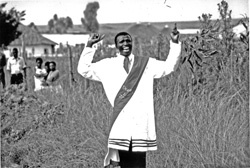 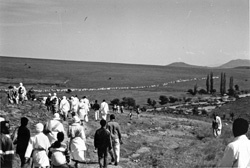 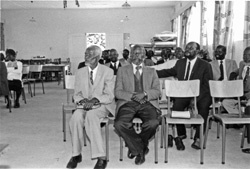 Description: "Circle gliding at Zionist service in Bishop Nombinja's church, Congregational Catholic Apostolic Church in Zion of Transkei." 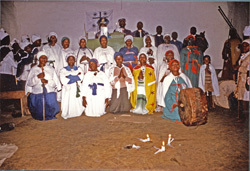 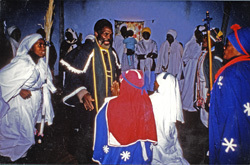 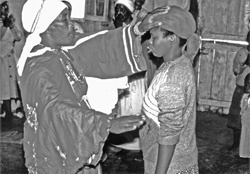 Description: "Prayer for healing at Zionist service in Bishop Nombinja's church, the Congregational Catholic Apostolic Church in Zion of Transkei." 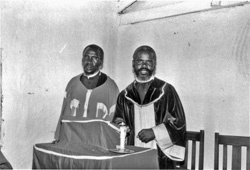 Description: "Pastors present at Christmas service at United Zionist Apostolic Church of Jesus Christ. 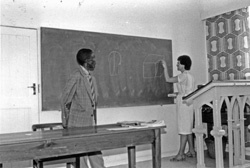 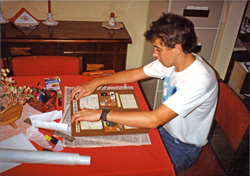 Gary Isaac's teaching chart on the names of Jesus on wall in background." 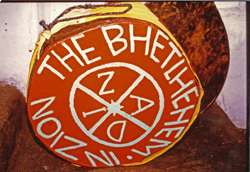 Description: "Drum used in African Independent Church worship. 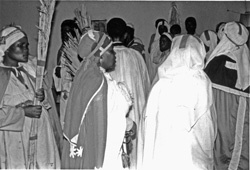 Drum is most important instrument in worship and accompanies all singing and movement. 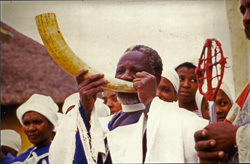 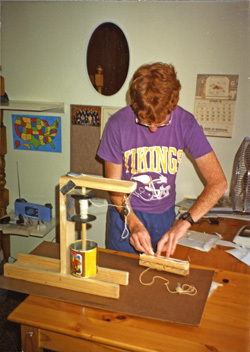 Made of cut barrel for drum and hide or skin. 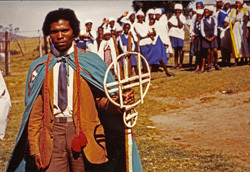 Drum is associated with power and the presence of the Spirit." 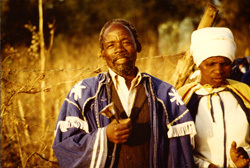 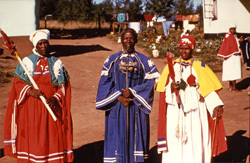 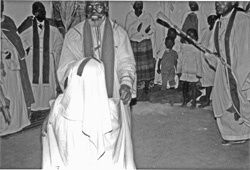 Description: "Bishop Mpehla, Misty Mount, holds staff. 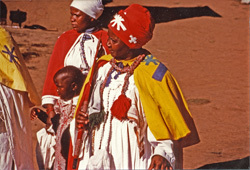 The star and moon are symbols of light." 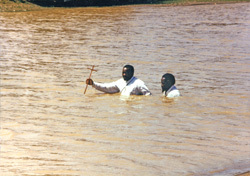 Description: "Rev. 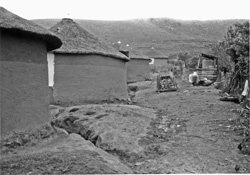 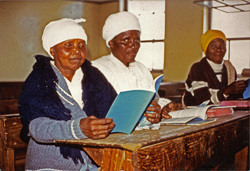 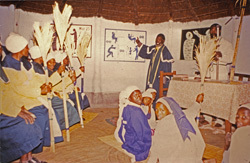 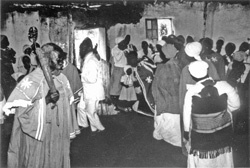 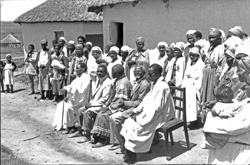 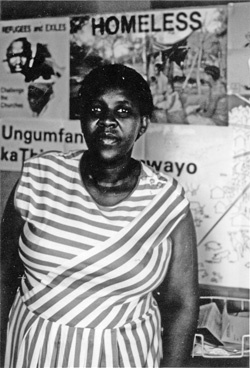 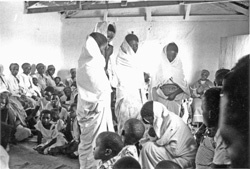 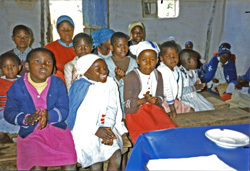 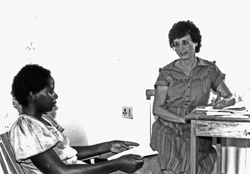 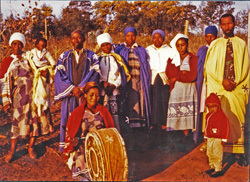 Nombinja teaching congregation. 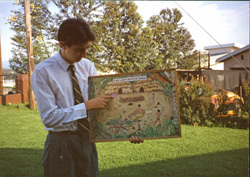 Posters he's using are similar to kind used by Larry Hills. 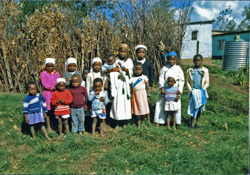 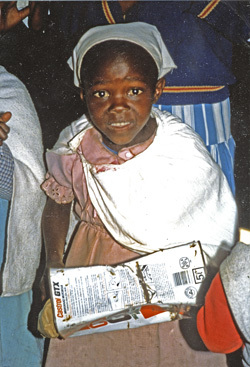 They are effective in rural areas." 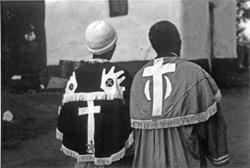 Description: "Zionist church members in uniform. 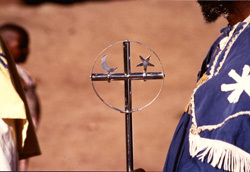 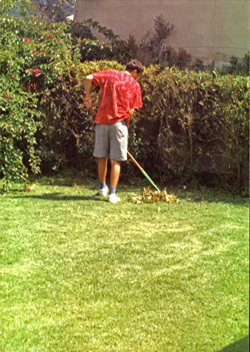 The staff held by man has moon and star on it which represent light." 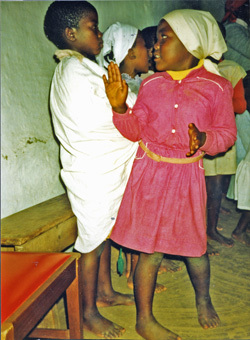 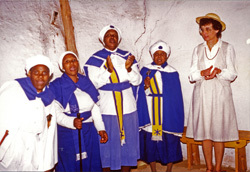 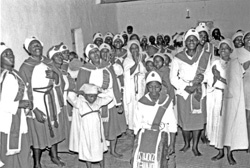 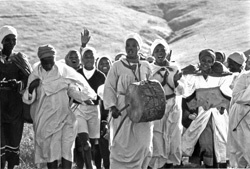 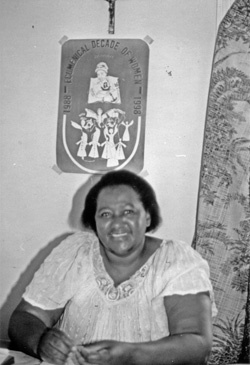 Description: "Prophet Mrs. Amanda Mpehla prays for a young woman during a Zionist worship service, Misty Mount, Transkei, South Africa"
Description: "Bishop Mpehla leads Zionist church members in a circle dance to gain power for healing in Misty Mount, Transkei, South Africa"
Description: "Mennonite missionary Larry Hills poses with Mpehla family outside their home in Misty Mount, Transkei, South Africa. 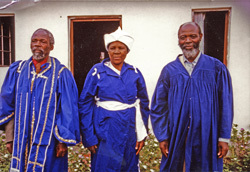 Bishop Solomon Mpehla and his wife, Amanda, stand closest to Hills. 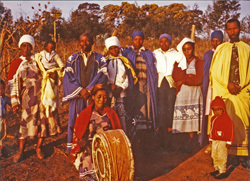 Daughter Agrinette is at the far right." 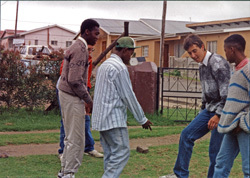 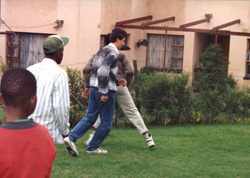 Description: "Mitchell and Stuart Isaac playing soccer with friends. 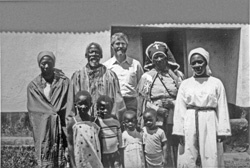 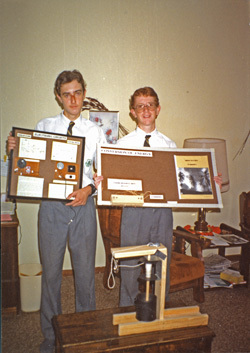 Mitchell is 2nd from right. 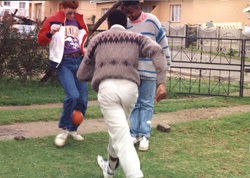 Stuart is almost completely hidden by tall boy in center."